They say that a day here at Penland School of Crafts in a concentration session is equal to a week in the real world and it really feels like it. Penland is a demanding blissful escape into the world of fine crafts and is one of North America’s finest craft schools. 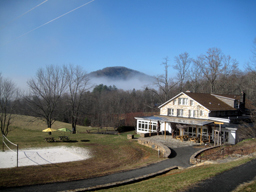 It is somewhat isolated in the Blue Ridge Mountains of North Carolina and attracts top instructors and students in many disciplines. I am part of a team of work-study students. We work 20-25 hours a week in exchange for half tuition, room and board. The studios are open 24hrs a day and one studies for 2 months in a specific discipline, every day. In addition to the regular classes with the core guest instructors in a chosen discipline there are also special guest instructors that visit and lecture too. If that wasn’t enough artistic frisson, there are Resident Artists and Core Students as well, this leads to multiple slide shows, impromptu gatherings, parties and dances with costumes. The strong bonding experience of living and working with a small core of people intensely focused on working, creating and learning and a general lack of sleep creates the opportunity for plenty of cross disciplinary art opportunities to form as people get to know each other. Last week a mini ad libbed opera was performed during dinner in the pot washing room as soap bubbles and water flew and burnt pots were being cleansed. I am in the Colored Porcelain concentration but have spun off to do 3 other alternative collaborative projects. One is a fictional book that will show how everything in the Pines Dining Hall is made in the craft studios of Penland. The second project is a book about the work-study experience here which will hopefully have a DVD component. The third project is a fine art naughty sculptural project, involving, at this point in time, 5 studios. More information on these projects will be posted at a later date as they are nearing completion. Concentration Plus 3.